Mandarmani is an upcoming attractive tourist destination for all ages of people. Mandarmani is just 170KM away from Kolkata and 34KM from Digha. Any one of any age must enjoy here. This is located in Medinipur. Especially Mandarmani is located in East Midnapur or Purba Medinipur. This is a sea coast area. The scenic beauty of this location is really mind blowing. Your mind must be refreshed if you once come here. This is a location where you can get all kind of amusements to get relief from any kind of day to day disturbance and mental depression. So if you don’t still visit this place, must visit this place as soon as possible. You may visit this place as a weekend trip. You may plan with your friends, with your family and even with your near and dear one. This is a place with extreme romanticism. So if you wish to visit Mandarmani, you may follow the instructions to go there. Tourist may reach in Mandarmani by Air . Nearest airport from Mandarmani is Kolkata. From Kolkata Airport there are various mode of transports available to reach Mandarmani. You can hier a taxi or can take a Train or can reach Mandarmani by Bus. It will take around 4 to 5 hours to reach in Mandarmani by Car from Kolkata airport. There are various options available to reach Mandarmani from Kolkata. You can also avail the road connections. You can drive your own car as per the map shown here. You can also hier a Cab from Kolkata. Road condition is excellent and its an wonderful drive from Kolkata. Have a break in Kolaghat to have some snacks and then continue to Contai and then Mandarmani. Road from Chawlkhola to Mandarmani is not as good as highway but not bad as well. People like to drive the car on the beach as well. But remember, you car may get into the sand and then you may get stuck. Be careful before driving car on the beach, its not recommended. 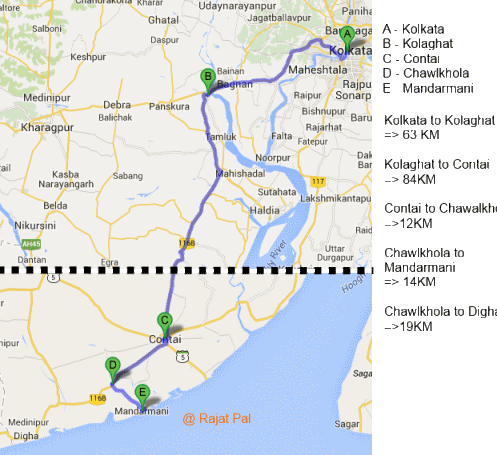 Mandarmani is at around 170 KM away from Kolkata and from Ranchi this is near to 310 Km away. Plenty of Buses are available every hour from Esplanade, Birati, Barasat and various part of Kolkata. Threre are Ac and Non/Ac Buses are available. No Bus goes to Mandarmani directley but it passes through Chawlkhola, where you can get down and get a local rtansportation to reach the beach area (Around 19KM from there). Train is also another alternative to reach in Mandarmani. Train is always a comfortable option. But for Mandarmani train is not a soothing option. Take a train from Howrah to Digha. From there you take hired taxi. There are many options available to reach Mandarmani from Digha station.